Dolores has been in financial services for 25 years with specializations in commercial banking, private banking, and wealth management. Previously she was a senior private banker at a national bank serving clients in Santa Fe and Los Alamos, as well as all of New Mexico and West Texas. 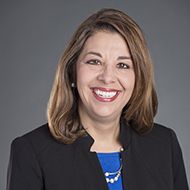 In addition to her extensive banking background, Dolores previously owned a small business that provided strategic business consulting and business management services. She uses this experience and perspective to help customers find the solutions and outcomes that are best for their business and their families. She currently holds Series 7 and Series 66 securities and investment licenses. What do you want clients to know about your team? Our department consists of experienced and knowledgeable professionals whose goal is to assist our clients in meeting THEIR goals. We truly believe in a team approach and work together to ensure that we are providing resources and solutions that will benefit the client. Each of us brings knowledge in banking, investing and trust administration and the sum of this knowledge is the benefit we provide to the client.